Oppose one fossil fuel boondoggle; oppose them all. KMI also has applied for a FERC permit to build a pipeline from Suwannee County, FL to Jacksonville, which is gearing up for LNG export. That KMI application says Sabal Trail can connect if it wants to. Coastal Group of the Georgia Sierra Club, on facebook, today, ATTEND THIS PUBLIC MEETING IF YOU CAN! This will be our opportunity learn about Texas energy giant Kinder Morgan’s disaster plan for the proposed liquefied natural gas (LNG) export terminal at Elba Island. 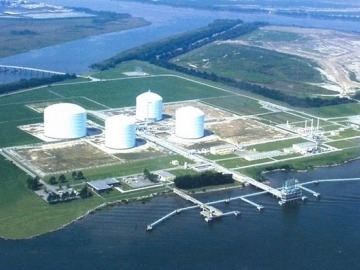 If permitted to come online, 4 million metric tons of LNG would be processed by, and exported from, the facility annually—in close proximity to densely populated neighborhoods at the mouth of Savannah’s port. A worst-case event would be extremely destructive to lives, property, and the environment. The information in your post above is not accurate. Kinder Morgan will not be presenting at this meeting. Thanks for your attention, but I don’t see anywhere the post above says Kinder Morgan will be presenting at this meeting. I imagine people would be happy to ask you questions if you appear at that meeting, however.